I saw the movie "BAGDAD CAFE (Out of Rosenheim)"
(New director's cut version) yesterday. of my blog as recommend. I saw the movie many times. And I like the song "Calling You" that inserted song. Of course I can sing this song. This movie is 1987 German film. again, and it released in Japan from this month(December). I went to this cinema. "Cine Nouveau"
"BAGDAD CAFE" is included several my favorite things. I really like the color of the movie. And inserted song "Calling You" ! Movie and music was so fit. 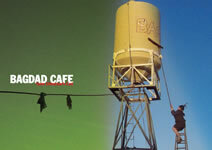 The BAGDAD CAFE is on the Route 66 in the US. Of course we can eat or drink there now. I'd like to go there...!! 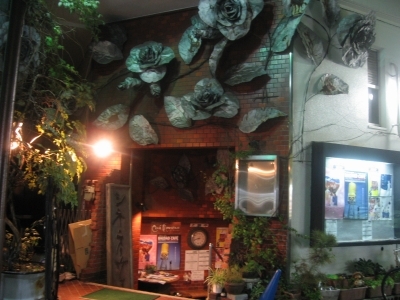 I felt so good because of the nice small cinema, and nice movie. And after the movie, I went to see the Rubber Duck!